UPDATE: May 25, 6:50 pm. John Alba has been executed. Tuesday, May 25, Texas is scheduled to execute John Alba (TDCJ info). He has a 10th grade education. If he is executed, Alba will be the 458th person executed in Texas since 1982 and the 219th person since Rick Perry became governor. He will be the 11th person executed in Texas in 2010. Use the Governor’s email form to contact Perry to express your opposition to this execution. Or call Perry and leave a voice mail at 512 463 1782. If you live in Texas, call your state legislators and let them know that you support a moratorium on executions. Find out who your legislators are here. 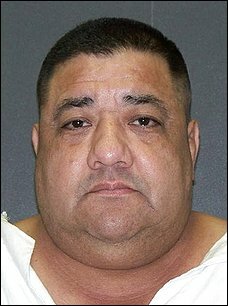 John Alba, 54, is set to die Tuesday for killing his wife nearly 19 years ago. He will be the 11th Texas inmate executed this year unless his attorneys succeed with an appeal filed Monday in state court. The U.S. Supreme Court refused last week to hear an appeal in which Alba’s attorneys argued his death sentence violated his civil rights because prosecutors emphasized the fact that Alba was Hispanic and his slain wife was white when they questioned potential jurors. Another execution is set for next week in Texas. George Jones faces lethal injection June 2 for a fatal carjacking robbery in Dallas 17 years ago. Click here to join the Texas Moratorium Network Facebook page to stay current on death penalty news. My days on Death Row (D/R) are spent locked away 23-hours-a-day in a 6-x-9 cell. We are allowed to recreate for one-hour each day. One shower a day. There are no TV’s on Texas D/R. We are allowed to buy a small plastic radio from the prison commissary store, and that is our ‘entertainment’. We are allowed to correspond with free-world people. So as one can imagine, mail-call in the evenings are our ‘highlight’ of the day, what we look forward to each day. We cannot receive packages from the free-world, we must buy everything we need from the prison store. We can only receive books from the publishers or website book sellers like Amazon.com. We are allowed one (2-hour) visit every week. However, we are also allowed 2-special (4-hour) visits every month, as well – but only if our visitors are coming from over 350-miles away, which my family does not qualify. Every 6-months, they lock down the entire prison and they search our cells and personal property. It is then that we are fed a sandwich 3-times a day. We are only allowed to shower on Monday, Wednesday, and Friday. No recreation. It is hard to be locked away in prison, in a small cell, with nothing to do, nothing to occupy your time – and mind. A human mind needs to be stimulated. My cell is painted completely white, which can play havoc on ones eyes. I have had to put up magazine pictures on my walls so as to break the whiteness. My daughter Sabrina wrote to me 2-days ago! She hopes to be coming to visit me soon – which I am looking forward to seeing her again. It has been almost 2-months since I last saw her because she recently gave birth to my youngest Grandchild, Thomas. It has been even longer since I last saw her other 3-children). But they have to go to school so I can understand. And it is a long drive (4-hours) to this prison, from their home. Children can get “cranky” on long trips! But I do love speaking to them, as they have so many questions to ask, and so much love to give. Yet, they still don’t understand ‘why’ they cannot touch “Paw-Paw” (Grandpa) as we are always separated in the visit room by a thick glass. I too, wish I could hold them but we have to be content to press our fingers against the glass and somehow feel each other’s warmth through the glass – or imagine it. My other children have had 5 kids between them, so I have 9-grandchildren total. I saw two of the youngest in December 2001. I hope to also see them again soon.